← W.4_Lilly Wasitova_ Where To Go for Study? Our plants (GS, SS and AWT) use a large number of electric motors as their equipment drivers. All equipment drivers must be kept on running condition all the time to ensure plant’s high productivity. These drivers have their electrical power supplied from the Switchgear, MCC, & Switch-rack, and thus the equipments condition is deemed critical to the reliability of the whole plant. Unavailability of process driver in our plants shall disconnect a chain of process and creates a downtime and inevitable losses. 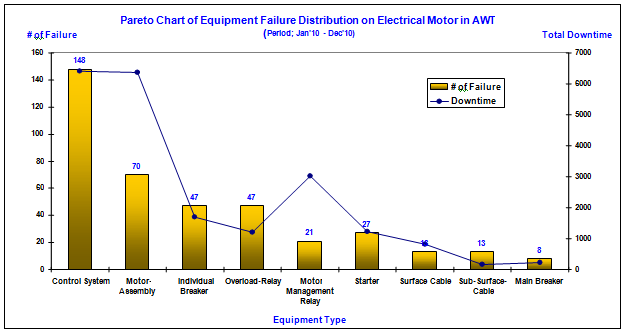 Therefore, there is always production losses associated with Switchgear, MCC, Switch-rack problems. 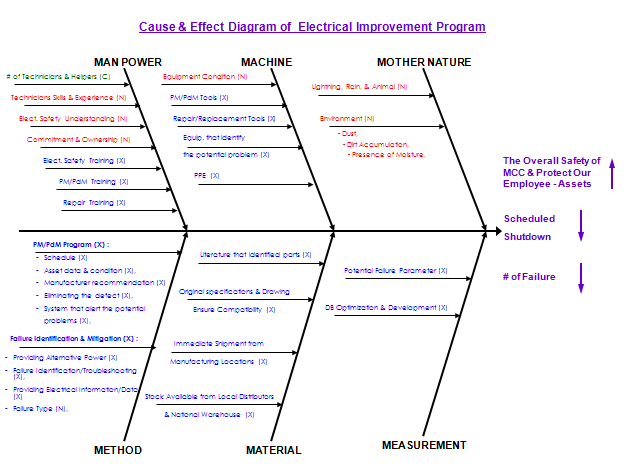 The biggest impact to production will trigger the schedule of improvement action. 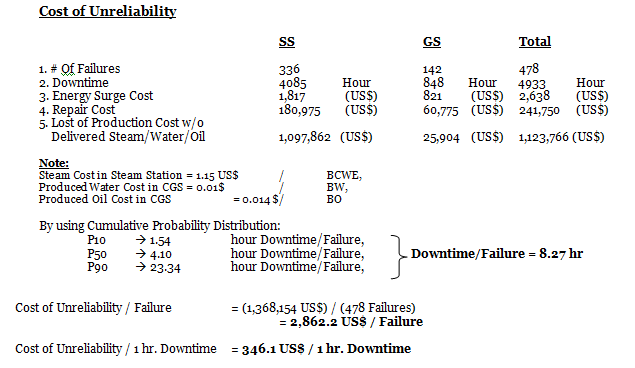 A method of recording and analyzing all significant cost metrics associated with equipment downtime in a plant (GS, SS and AWT) and providing a way to assign time and/or monetary value to previously considered “non-tangible” cost of downtime. 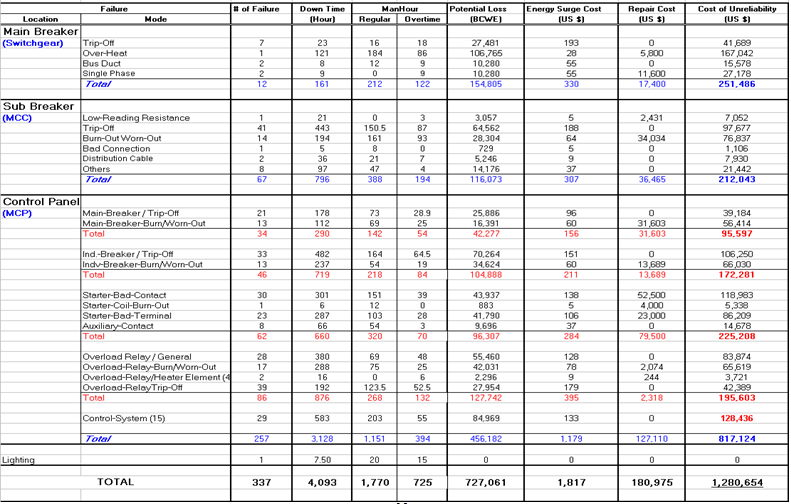 Lost of potential production cost without generated steam and delivered water & oil excluding the possibility of bottleneck. Man-hour (regular and overtime), in this calculation we’ll not include this man-hour cost. 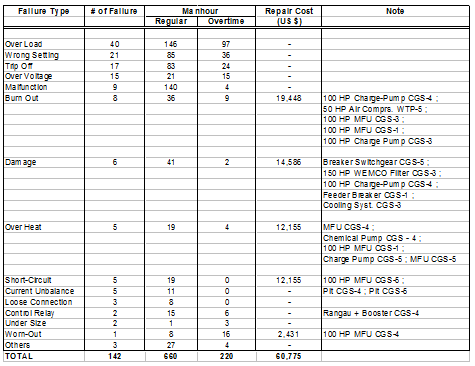 During period January ’10 – December ’10, we had 478-failures and 4933-hour downtime on electrical motor protection (MCP) & power supply system (switchgear + MCC) in GS and SS with the Total Cost (True Downtime Cost) 1,368,154 US$. 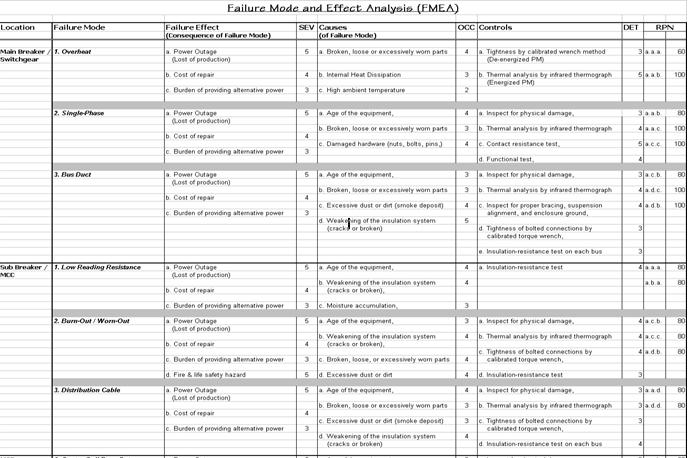 To provide meaningful management reports that will enhance control of maintenance of MCC (% reliability, % availability, MTTF, etc.). To ensure that maintenance is performed efficiently through organized planning and coordinated use of material, manpower, and time is a necessity. Industrial Accident / LTI – zero. Good team work & coordination – meet on regular basis, good cross functional participation and good team commitment. Follow the project management practices. Follow HES procedures and approved standards & codes. Peters, Max S & Timmerhaus, Klaus D. (1991), Plant Design and Economics for Chemical Engineers 4th Edition, Singapore: McGraw-Hill, Inc.
Sullivan, William G., Wicks, Elin M. & Koelling, C. Patrick (1942), Engineering Economy 15th Edition, Singapore: Prentice Hall, Inc. This entry was posted in Candra Nugraha, Week #5. Bookmark the permalink. Why not approach one of them and offer to walk them through a problem and if you do that, I will give BOTH of you credit- them for publishing their blog and you for mentoring them? If you don’t take me up on that challenge, then I would really like to see you pick an example using purchasing power parity, linear or some kind of regression analysis and predict costs out 1, 3 and 5 years out into the future. But clearly you understand the approach to problem solving that you will need not only to pass your AACE exams, but also to make you a more valuable employee!! Keep up the excellent work Mas Candra!! I am impressed!!! Mas Candra, given the recent mess in Japan after the earthquake and tsunami, from a RISK MITIGATION/RISK MANAGEMENT perspective, what have you done for these plants? While I realize there is no nuclear meltdown, have you done a comprehensive risk assessment given Indonesia is prone to both earthquakes and tsunamis? Might be a great topic for a future blog from Chapter 12 of your Engineering Economy?